Nonprofits have a key advantage when it comes to millennials. This generation has a vested interest in the social impact of their job, and believes there is a clear responsibility on the part of everyone to improve society. As a whole they want to work for organizations that have a transparent and forward-looking mission to achieve this goal. Who better than nonprofits to meet millennials’ expectations and fulfill their need for socially-conscious work? Of course, a strong mission and dedicated staff aren’t the only things millennials need to be happy. No different from genxers and baby boomers, millennials want job enjoyment/engagement, to feel helpful, and authenticity in their workplace. On a mass scale, they are quick-thinking problem-solvers who value collaboration whether in person or via technology. And contrary to popular opinion, millennials aren’t “entitled” but rather eager and ready to grow in many directions. They will likely ask for advancement opportunities not because they feel deserved but because they want to continue learning. 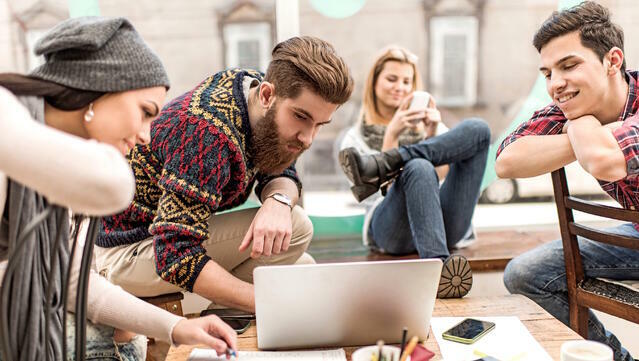 Technology: No shocker here – millennials are the most connected generation in the US workforce, and have the capacity and knowledge to connect with anyone, anywhere, anytime. Mobile sites and social networking will be the key to nonprofit recruitment of millennials, as these are the venues most used when job-hunting. Video resumes and video interviews allow more flexibility and opportunities for organizations and potential employees to get to know each other in an informal way. Nonprofits looking to hire this generation should pay close attention to social networking efforts especially, and use current employees to help establish an appealing online culture that is attractive to millennials. And speaking of…. Open minded: Millennials have a sticky reputation for jumping ship and heading for greener pastures. But that doesn’t mean they aren’t dedicated to the organizations they work for. Instead they are a generation used to change and opportunity, and as such they are excited to try new things and explore new prospects. Nonprofits can take advantage of this in smart ways that keep millennial employees happy and engaged. One way to is to ask prospective employees about their goals and how they want to grow, and then follow-through with the support and development opportunities to get them there. A second way is to really listen and adhere to the knowledge millennials bring to the table in terms of new solutions to workplace challenges, especially around collaboration and technology. These are areas of expertise for millennials – take advantage of it. On top of all of this, compensation is still a major pull for millennials, as for most generations. Beyond salary, millennials are looking for great healthcare and other benefits to round out their total package. Nonprofits need to search for a solution that significantly reduces employee out-of-pocket expenses to pull in and retain top talent. Contact us for more information today. Want to learn more about reducing employee out-of-pocket expenses?